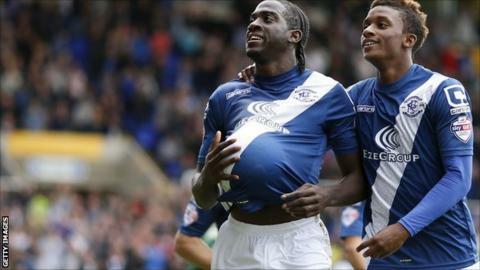 Clayton Donaldson scored a first-half hat-trick as Birmingham City defeated Bristol City to climb up to fourth. Donaldson stabbed into an empty net for the opener before converting Jon Toral's pass from close range for 2-0. Jonathan Kodjia got the final touch on Joe Bryan's square pass to pull one back for Bristol City, before a penalty completed Donaldson's treble. Kodjia volleyed home his second but it was merely a consolation as Jonathan Grounds' header sealed the points. Bristol City have now slipped to 21st in the Championship, only a point above the relegation zone. Donaldson scored his first goal inside 10 minutes, stabbing into an unguarded net after being found by David Cotterill. Donaldson's 31-minute treble was the sixth hat-trick of his 170-goal career and his second for Blues. He has also earned the matchball playing for York City, Hibernian and Crewe (twice, in the space of a month in 2011). And he was on hand to score his second converting a low pass first time when unmarked from close range with Bristol City claiming offside. Bristol City had a lifeline when Kodjia finished from close range before Marlon Pack struck the outside of the post with a curling free-kick. But Blues earned a penalty when Jon-Miquel Toral was brought down by Baker and Donaldson made no mistake from the spot to restore his side's two-goal lead. Pack then came close to pulling a goal back for the visitors but his strike from the edge of the box curled just wide of the Birmingham goal. Bristol City were eventually back in the game with Kodjia's second of the match - a hooked volley from 10 yards after good work by Aden Flint. However, Grounds' header from Cotterill's corner ensured there was no nervy finish at St Andrew's. "I was really pleased with the performance, particularly for the first 60 minutes. After that we allowed the game to become a little too open. I think this was due to Bristol City's formation and the way they tried to attack. "We took a little bit of gamble with our tactics by playing our wingers higher up the pitch. We felt this could give their wing-backs a problems and we got a little reward for it. "Where I felt we could have done better was their two goals as we were a little open. I've made my point in the post-match talk." "We created enough chances to have won. We definitely feel hard done by with the penalty. It was a big moment in the game for us just after we had hit the post. "It was never a penalty. It was actually a booking. The referee must have been the only person in the ground who thought it was a penalty. "I'm frustrated because I feel we conceded soft goals. We created enough chances but we've got to take them." Match ends, Birmingham City 4, Bristol City 2. Second Half ends, Birmingham City 4, Bristol City 2. Attempt blocked. Jacques Maghoma (Birmingham City) left footed shot from the left side of the box is blocked. Assisted by David Davis. Attempt blocked. Callum Robinson (Bristol City) right footed shot from outside the box is blocked. Assisted by Luke Freeman. Luke Freeman (Bristol City) wins a free kick on the right wing. Attempt missed. Derrick Williams (Bristol City) right footed shot from outside the box misses to the left. Assisted by Aaron Wilbraham with a headed pass. Attempt missed. Stephen Gleeson (Birmingham City) right footed shot from outside the box is high and wide to the right. Attempt saved. Clayton Donaldson (Birmingham City) right footed shot from the left side of the box is saved in the centre of the goal. Assisted by Stephen Gleeson. Korey Smith (Bristol City) is shown the yellow card for a bad foul. Aden Flint (Bristol City) is shown the yellow card for a bad foul. Corner, Bristol City. Conceded by Jonathan Spector. Attempt missed. Callum Robinson (Bristol City) header from a difficult angle on the left misses to the left. Assisted by Luke Ayling with a cross. Substitution, Birmingham City. David Davis replaces Demarai Gray. Attempt missed. Aden Flint (Bristol City) left footed shot from the centre of the box is high and wide to the left. Assisted by Callum Robinson with a cross following a corner. Corner, Bristol City. Conceded by Paul Caddis. Goal! Birmingham City 4, Bristol City 2. Jonathan Grounds (Birmingham City) header from the centre of the box to the bottom right corner. Assisted by David Cotterill with a cross following a corner. Corner, Birmingham City. Conceded by Nathan Baker. Attempt blocked. Clayton Donaldson (Birmingham City) left footed shot from the right side of the box is blocked. Assisted by David Cotterill. Substitution, Bristol City. Bobby Reid replaces Joe Bryan. Offside, Birmingham City. Demarai Gray tries a through ball, but Clayton Donaldson is caught offside. Attempt blocked. Demarai Gray (Birmingham City) right footed shot from the right side of the box is blocked. Assisted by Paul Caddis. Attempt missed. Jonathan Grounds (Birmingham City) header from the left side of the box is high and wide to the left. Assisted by David Cotterill with a cross following a corner. Corner, Birmingham City. Conceded by Frank Fielding. Attempt saved. Jonathan Grounds (Birmingham City) left footed shot from the left side of the box is saved in the top centre of the goal. Assisted by Jacques Maghoma.